I’ve had emotional reactions to works of visual art, but I can tally them up. 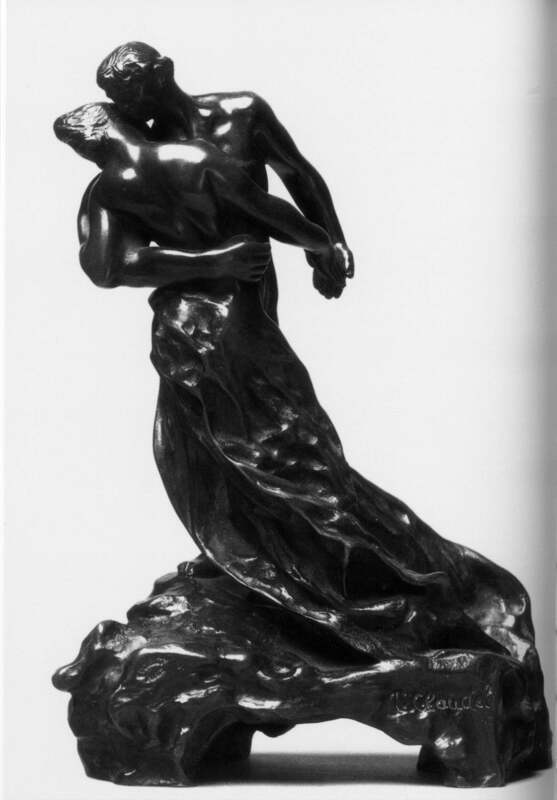 During AP Art History in high school, we looked at a photo of Camille Claudel’s sculpture The Waltz and I actually thought, “There is something very free in this sculpture.” For years, I’ve looked, with no success, for a reproduction (the actual sculpture is itself quite small) that I could purchase and have in my own home. Since then, there’ve been a few works that made me feel emotions: mostly the paintings of Renoir and Lucian Freud and one painting in (I think) the Prado that was of this forest except it wasn’t really a forest, it was just a bunch of green lines in a vaguely triangular shape. And each time, I’ve felt the same thwarted sense of longing. I think the problem is that we pretend an ideal is the best place to look at a painting, and it’s not. There are too many people around you in a museum. You can’t form a relationship with a painting when there are a bunch of other jerks around. And, secondly, when you see a painting you like, you want to look at it for a very long time. But in a museum, you always feel like you can’t, because there are too many other paintings around. Paintings–no matter how great–are diminished when they’re part of a crowd. This is yet another example of the way in which creating a culture of mass-market “art appreciation” actually decreases true appreciation of art. The ideal way to look at a painting is in your house, while it hangs on your own wall. But, since I obviously can’t afford to buy a Klimt, if I wanted to look at a painting in that way, I’d need to go out and buy one. That’s absolutely doable, obviously, but it requires a tremendous boldness. It’s one thing for me to say that I enjoy looking at the most expensive painting in the world. And it’s another thing to say that I like looking at a painting that I bought for $200 from some Maryland College Institute of Art (MICA) student. I’d need to have a lot of confidence in my taste before I could do something like that. And that kind of taste can only come from looking at paintings at museums. So we come full circle. Well, fooey. I’ll just have to wait until I make a few million dollars, and then I’ll buy one of this guy’s paintings. Then I looked up the artist, Giovanni Boldini, and realized that I was already familiar with at least one of his paintings! 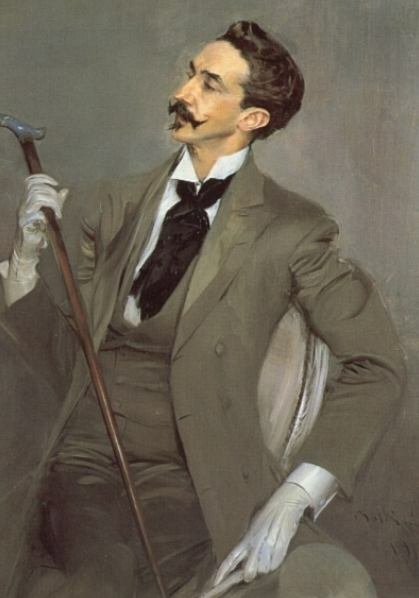 I’ve always like this painting of Robert de Montiesque that adorned one of my Proust volumes (it’s a portrait of the real-life person who was, supposedly, the impetus for Baron de Charlus), but I’d never bothered to figure out who painted it. 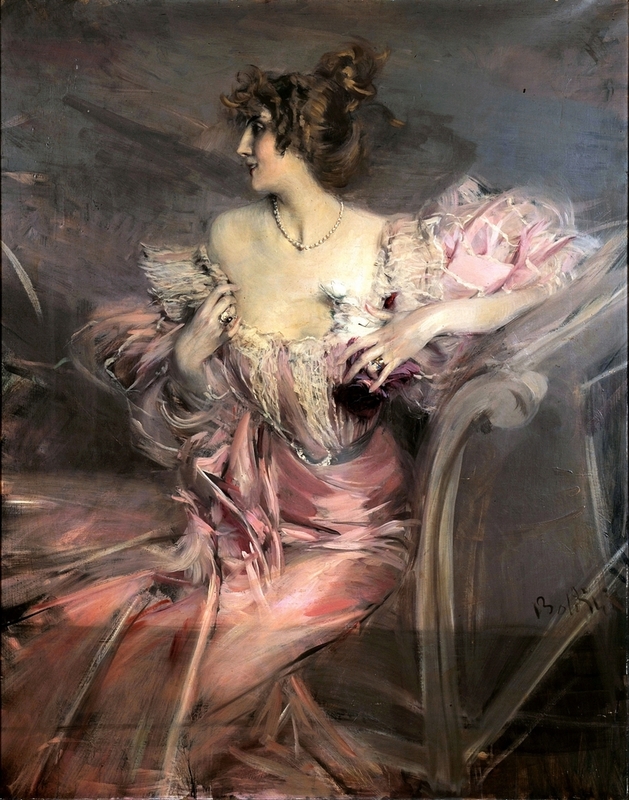 Anyway, when I went and looked at Boldini’s paintings, I realized that I liked them very much. It made me sad. I will never possess these paintings. The closest I will ever come to them is as images on the computer screen. Or, at most, a few minutes of viewing if I ever visit a museum that has one of them. I don’t know. It’s good that I don’t like art that much. I don’t know how art-lovers manage. If you love music or literature or film, then you can possess what you love. People who love the visual arts are never able to do that. I’ve done this in museums too. And I agree that it’s pretty doable. Especially if you go during a bad time for tourists. For instance, going to a DC museum during August was usually pretty solid. However, I don’t think it’s as good as viewing the painting in your own home, repeatedly, over the course of many years. It’s kind of an academic distinction, though, since the art you view in museums is generally going to be so much better than the art that you could view in your home that it’s all probably a wash.
Good news! Our society produces really good replicas of famous works. The best replicas are indistinguishable from the originals when placed side by side, at least to people like us. It may cost you thousands of dollars to get an ultra-high-quality replica, but certainly not millions. So do you implicitly place a lot of value on the uniqueness/originality of the original painting? Or would you be happy with a good replica instead? I mean, sure, there is something special about the original. But if art *requires* originality to produce an emotional reaction, I think it has basically failed. Anyone can make an original painting, but it’s the actual elements of the painting that should determine whether it succeeds as a work of art. Besides, it is actually something of an accident that we even have the option to elevate The Original in the visual arts at all. Plenty of other arts have no analog to the “original Starry Night”, and do just fine without it. Mozart’s scores are a template for music that must then be turned into reality by an orchestra. Originally, Mozart also had the opportunity to conduct the orchestra and push his vision through all the way to the final product. That latter part of his influence is lost now, though. We don’t know exactly how Mozart wanted his music to be played, and we are limited to what his scores can imprecisely communicate. What we hear today is, in a sense, replicas of the original work — replicas which, I might add, are considerably further from the original than a high-quality replica of a painting. Fortunately, even a recording of the non-original orchestra playing the Serenade is enough to produce deeply emotional reactions. It still has *most* of what was amazing about the original. Does a medium-quality replica of a painting not? You say: “If you love music or literature or film, you can possess what you love. People who love the visual arts are never able to do that.” But if a recording of music is analogous to a medium-quality replica of a painting, then music and painting are the same. In fact, rather than painting having a deficit, it comes with the additional *bonus* that someone gets to own the original work too. Suppose that somehow it was matter of course for composers not to conduct orchestras, but rather to build these idiosyncratic machines to play instruments exactly the way they wanted, one for each piece, and that these machines survived to the modern day. Then these performing machines would be treated just like famous paintings. We would make pilgrimages to the museum/concert hall that had the one original machine for Mozart’s Serenade for Winds, and we would hold it up as the ideal. Orchestras would try to mimic it, and people would enjoy the replicas, but there would be nothing so good as the original. We would have recordings of the original, but recordings are not full fidelity either. Actually it would be kind of sad if the existence of such machines lessened people’s appreciation for the recordings and orchestral performances which today are all they have. Xan, I don’t agree with the premise here. You cannot create a perfect replica of a hand-made art object like a painting. I mean, maybe someone’s figured out how to do it for, like, the Mona Lisa. But not for a minor artist like Boldini. If I could have an exact replica, then I’d, of course, really enjoy that. I don’t particularly care about the sentimental value of this being the actual thing created by the actual guy. The important thing is not really that people can create an exact or perfect replica, as long as you don’t need a perfect replica to extract most or all of the joy that the original generates. In any case, it is apparently within the grasp of talented painters to create replicas that the lay person cannot distinguish from the real thing, given that we regularly hear stories of art forgeries. Surely you could commission such a work for your painting of choice. It might cost you thousands for the services of a highly skilled replicator, but certainly not millions. A quick google search turns up lots of painters standing by to replicate a Klimt for you. I have no idea how good they are, and I also have no idea how good you demand them to be. But my preconception is that you could actually be happy with quite a divergence from the original painting. Might the colors and textures be noticeably different in a side by side inspection? Sure, but let’s not pretend the colors on the “original” still look the way they originally did when Klimt painted them. 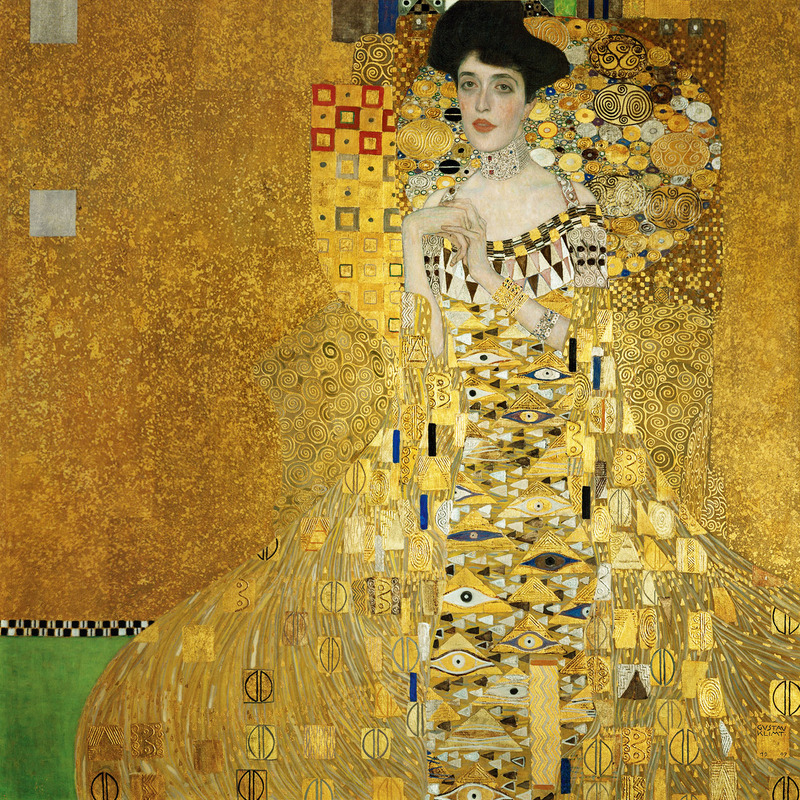 And it’s not as though Klimt actually chose the true optimal colors for your subjective tastes anyway. I dunno. I just find it very implausible that Portrait of Adele Bloch-Bauer, in its current form, is this ideal that generates high value which drops off quickly as we move slightly away from the ideal. Can the value drop off so sharply that no affordable replica comes close to generating the same experience for you? It’s not obvious to me that you would even need to spend over $100 to get an acceptable replica of the painting of your choice. There is always the Dafen Oil Painting Village in China; apparently some of the painters there are quite good. Well, of course I’m not gonna pay $122 million for it. I woudn’t even pay $5000 for a painting. It’s a painting. Paint on a canvas. I refuse to pay more than $5000 for anything that doesn’t have moving parts. Furthermore, as I noted in my article, I am open to replicas. I actually looked for (and have been looking for) a good replica of The Waltz. But all the ones that I see on the internet (like this one: http://www.ebay.com/itm/like/190900627254?lpid=82) don’t actually look very much like the original. I don’t want a replica that merely reminds me of a superior one. I want one that evokes the same feelings that the original does. sorry to have missed the part about looking for replicas of The Waltz. Sculpture may be much more difficult since there are pretty big up-front costs, but on the painting front at least, it seems like you should be able to find a pretty good replica for well under $500. I am intrigued by this supposed difference between music and painting. Recorded music is like a lower resolution version of the original, but it’s still pretty satisfying to consume. Why can’t, say, a good photo print of the original painting do the same? Or a replica that isn’t perfect but which communicates much of the original’s essence? It can’t just be that in painting we constantly know what we’re missing. We listen to live music too. And while it would be great if I could hear my favorite musicians live whenever I wanted to listen to a song, that hardly wrecks my experience listening to recordings which are the next best thing. Maybe the technology just isn’t here yet for the visual arts. Or maybe music is just fundamentally so much more compelling that it must clear a lower bar. Or maybe our eyes are much better at noticing small differences and being bothered by them. Or maybe we haven’t spent enough time looking at good replicas of paintings to know what they would do for us. In music, the resolution is better, but the performance is better. You’re not getting the full sonic effect of listening to Beethoven’s Fifth in an orchestra hall, but you are listening to it being performed by the best orchestra w/ the best conductor on their best day. Also, you can listen to it in your house. That’s pretty cool. I like looking at pictures of paintings on the internet, too, even though it’s not nearly as good as listening to them in person. Yep, lots of things are gonna be awesome once 3d printing really happens. Like they’ll be able to 3d print human organs. Definitely worth looking forward to, and not nearly as absurdly improbable as the other sci-fi hypenologies like brain uploading, AI, self-replicating nanomachines, and all of that.